In the wake of International Women’s Day and to celebrate Women’s History Month I’ve put together a group of very different women. They may have shared a stage or an orchestra, they may never have met but they all knew the hard life of the performer and the vagaries of managers and audiences alike. They are largely forgotten but live on through their photographs and I would like to pay tribute to them. Gertie Rex was described as a character comedienne and Scotland’s leading comedienne. She wrote and produced at least one pantomime in which she also appeared. She staged Humpty Dumpty in 1923 and took the part of the ‘leading boy‘. Gertie was described as a highly entertaining artiste with her catchy songs. Another report tells us that ‘Gertie Rex knows the way to the heart of her audience’ which is tribute enough. La Tortajada was a Spanish dancer who roused great passion in her male admirers. She had jewels thrown at her feet and duels fought to protect her honour. She accepted these things modestly. The next card has the inscription’ one of the Delevines’ not giving her a first name. I found a picture of a card signed by all the Delevines and I matched her with Minnie. The Five Delevines were made up of two women and three men and they made music and danced in a sprightly fashion. 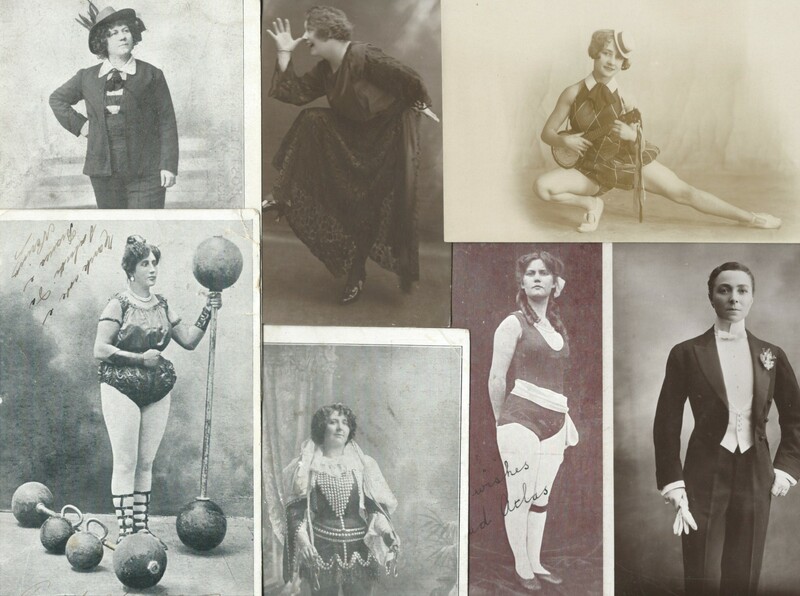 They were also acrobats and comedy artistes, playing guitar and providing acrobatic and musical entertainment which seems to have been based around a short sketch. Imagine doing all this several times a night, travelling all over the country and then not being granted a first name. Mademoiselle Amelia cuts a determined figure looking out from beneath her curls. She appeared with music hall and circus acts and is described as a sylph-like equestrienne. She wasn’t top of the bill but performed for a good many years, the photo suggesting acrobatics or gymnastics on horseback. This is an iron-jaw act where the artiste used their teeth to hang from a leather strap while performing acrobatic movements. This is a later photo but is the only one I have in the collection to show the act in progress. I don’t have the name of the performer. Originally the strap had a metal hook at one end to attach to a trapeze etc while there was a leather mouthpiece at the other end which was gripped by the performers in their teeth. The mouthpiece shown here was used by Pansy Chinery and is in the V&A collection. Her teeth marks can still be seen. Margaret Cooper trained at the Royal Academy of Music and was persuaded to perform on the halls. Managers were always aiming for respectability. W. MacQueen-Pope in his book ‘The Melody Lingers On‘ describes Margaret as ‘beautifully dressed, she would sail on to the stage. Then she would seat herself, take off her elbow length gloves with great care and in the most leisurely manner, and then proceed to remove her numerous rings and bracelets, which she placed one at a time on top of the piano. The audience would watch spellbound. Although her voice was neither strong nor powerful, she had the knack of making every syllable heard, every word tell, and that without a microphone’. Margaret defied superstition, always insisting on dressing-room thirteen in which she put down a green rug, considered an unlucky colour, which she brought with her. This entry was posted in Music hall artistes, Uncategorized and tagged Delevines, Gertie Rex, Iron-jaw act, La Tortajada, Madamoiselle Amelia, Margaret Cooper, Mdlle Amelia on March 19, 2016 by Monomania.